SPRINGFIELD – A rate hike on check cashing services will be lower than originally proposed, and rates for those on public assistance will become lower, under a compromise reached today. State Senator Jacqueline Collins joined activists from a number of groups pushing against a higher proposal at a press conference today to thank advocates and explain the impact of new rates. CHICAGO – Representatives of Fifth Third Bank addressed concerns from the community today surrounding what some have called onerous security measures at branches in some Chicago neighborhoods. Senator Jacqueline Collins convened a hearing of the Senate Financial Institutions Committee at the Michael K. Bilandic Building to ask why some Fifth Third Bank branches in predominantly minority communities are equipped with buzz-in doors and metal detectors, citing other parts of Chicago and the surrounding suburbs that have had robberies but do not feature similar security measures. The committee heard testimony from Eric Smith, regional president of Fifth Third Bank and Marsha Lee and Pam Bosley, members of the Auburn-Gresham community, who expressed their concerns about the practices. The Rev. Michael Pfleger of the faith community of Saint Sabina also spoke to concerns he heard from the community, calling the doors “jail-like” and the security measures discriminatory. In closing, Collins asked for a summation of the methodology and procedures involved in selecting bank branches for heightened security features. Collins is chairperson of the Senate Financial Institutions Committee. A new session of the legislature is upon us, and over the past couple of weeks, we have heard from Gov. Bruce Rauner about his budget priorities for the state of Illinois. Unfortunately, what we heard is in keeping with his past proposals, which have invariably sought to undo programs and services that aid the neediest and most vulnerable in our community. 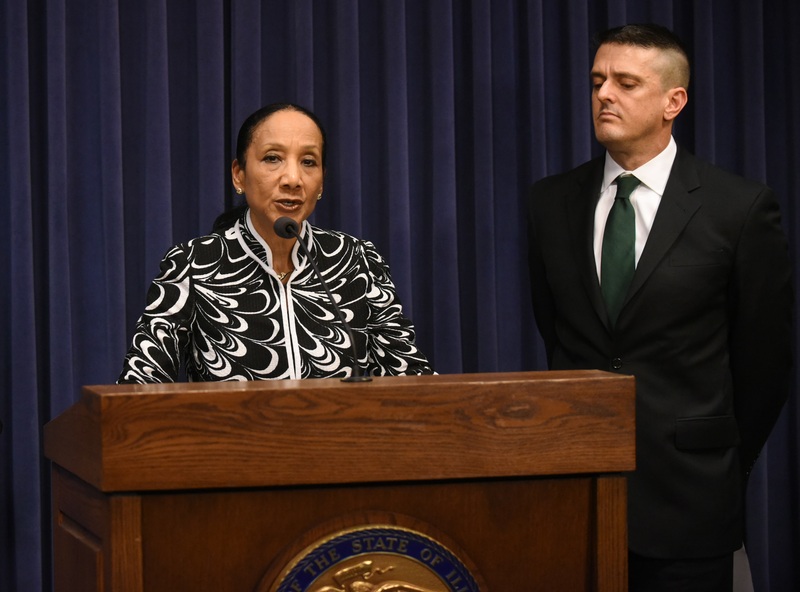 In addition to outright eliminating certain initiatives that help university students, the governor’s 2019 budget proposal reduces spending on Temporary Assistance for Needy Families, mental health services, and Redeploy Illinois, which has focused on keeping youth out of prison. After-school programs that seek to keep our children off the streets are also reduced or eliminated. Gov. Rauner himself has pointed out that the situation for the African-American community in Illinois is dire, with the worst unemployment rate in the nation and worse-than-average showings in every quality-of-life indicator. These are the root causes of violence in our communities. It is broadly understood that we combat the blight of violence through education, through attention to mental health and through job opportunities. Yet his budget proposes the exact opposite. I say it often because it bears repeating: A budget is a moral document. It is not solely about a bottom line, but about what statement we send to our community and our world about what we value as a society. I believe Illinoisans value using our resources to aid, protect and empower those who need help, because any of us might find ourselves in similar straits. That is why I oppose these cuts and urge you to raise your voice in opposition to them as well. Please call my office at 773-224-2830 to tell me how these proposed cuts might affect you or somebody you care about, or to speak about any other important topic in state government. State Senator Jacqueline Collins issued the following statement today in response to reported remarks by President Donald Trump. “Former First Lady Michele Obama once said, ‘Being President doesn’t change who you are; it reveals who you are.’ President Trump’s racist rant reveals who he is. “As a citizen of Chicago – a city founded by a Haitian, Jean Baptiste DuSable, I believe every decent minded person concerned about the values and vision of this country should be troubled by the temperament, tone and tin ear of this thin-skinned president.